And since Obama keeps making it easier and easier to avoid repaying those loans, it’s a problem that taxpayers will eventually have to shoulder. 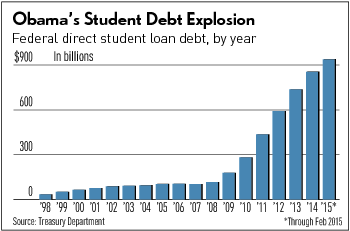 Through words and actions, Obama has encouraged irresponsibility on the part of student borrowers. He constantly talks as if student debt were an unfair burden they unknowingly had foisted upon them. At the same time, he’s made it easier and easier to avoid paying back student loans in full. Earlier this year, for example, Obama expanded eligibility for his “pay as you earn” program, which limits loan payments to 10% of income, with any debt left after 20 years forgiven. Students got the message. The St. Louis Fed reports that 27.3% of student loans in repayment are at least a month behind in payments. That’s a far higher delinquency rate than any other kind of debt, and it’s significantly higher than the delinquency rate 10 years ago. “This overall level of delinquency is very concerning,” concluded authors Juan Sanchez and Lijin Zhu. A 2013 Consumer Financial Protection Board report found that less than half of this federal loan money was actually being paid. About 30% was held by borrowers still in school or in a grace period, another chunk in deferment or forbearance, and almost 14% was in default. The problem here is that whenever the government nationalizes something that the private sector is doing, it always creates a problem. Let me explain. If student loans (or mortgage loans) are run solely by the private sector, then the motivation for lending money out at interest is to make money for the bank’s depositors and investors. In other words, because the bankers are in a free market and have to compete for depositors and investors, they have an interest in making sure that the loans they make get paid back. But when the government takes over loans, they are not interested in being wise with the money they lend out – it’s not their money. They want to lend out as much as possible today in order to buy votes, and then kick the can down the road on the repayment. So instead of being careful about asking “will this get paid back?” they ask “how can I borrow from the future in order to buy as many votes as I can right now?” And that’s how we got the housing crisis of 2008, as well as this trillion-dollar student loan crisis. When you take the profit motive out of the lending decision, then money gets lend to people who will never be able to pay it back. No private bank that has to answer to shareholders hands out money to students who want to study underwater basket-weaving. But the government does. They want to buy as many votes as possible. And besides, this is not their money. They are borrowing it from the future earnings of the very students they are giving it to! That’s what happens when you let big government decide everything. Whenever big government politicians want to buy votes with taxpayer money, they always sell it to the people with sob stories about some poor, helpless group of people will suffer through no fault of their own. There are a lot of voters who will vote for politicians who cry crocodile tears for them, especially ones who don’t understand economics. There is no free lunch – somebody has to pay. Democrats are basically throwing a party for students, and then mailing them the (unexpected) bill for it, with interest. What factors are contributing to the higher education bubble? This article from the Wall Street Journal was discussed at length by Dennis Prager on his radio show yesterday. […]Some college officials are also compensated more handsomely than CEOs. Since 2000, New York University has provided $90 million in loans, many of them zero-interest and forgivable, to administrators and faculty to buy houses and summer homes on Fire Island and the Hamptons. Former Ohio State President Gordon Gee (who resigned in June after making defamatory remarks about Catholics) earned nearly $2 million in compensation last year while living in a 9,630 square-foot Tudor mansion on a 1.3-acre estate. The Columbus Camelot includes $673,000 in art decor and a $532 shower curtain in a guest bathroom. Ohio State also paid roughly $23,000 per month for Mr. Gee’s soirees and half a million for him to travel the country on a private jet. […]Colleges have also used the gusher of taxpayer dollars to hire more administrators to manage their bloated bureaucracies and proliferating multicultural programs. The University of California system employs 2,358 administrative staff in just its president’s office. […]Today, only about 7% of recent college grads come from the bottom-income quartile compared with 12% in 1970 when federal aid was scarce. All the government subsidies intended to make college more accessible haven’t done much for this population, says Mr. Vedder. They also haven’t much improved student outcomes or graduation rates, which are around 55% at most universities (over six years). The most trouble thing for me is that we are taxing money away from current earners, and borrowing money from future earners, in order to subsidize many, many degrees that will never pay back the initial investment we are making to send them to college. The more that government jumps in to pay people to do useless degrees and then doesn’t get the money back, the more students are going choose useless degrees. Other countries like New Zealand and Canada have major problems right now because these loans are not being paid back. That’s what happens when government takes over student loan administration – they aren’t as concerned about being paid back. What’s also troubling to me is that people who choose not to go to college but instead to go to trade school or start their own businesses are subsidizing the worthless degrees that so many people choose to pursue today. Why would the government waste taxpayer money on these worthless degrees? Well, because college is four years of liberal indoctrination. Students are so stupid that they will actually accept the propaganda pushed by professors as if it were true, even though these professors often have no experience in the private sector themselves. And these students will have the illusion of being educated as they vote for the secular left come election time. They don’t even realize that they are voting to harm their prospective employers and increase the national debt which they will have to pay back. When I try to talk to them about it, they seem to fall back on name-calling instead of making any kind of factual case. This seems to be the result of college as well. They’ve learned to demonize their opponents rather than debate them with evidence. What does “quantitative easing” really mean? The video has gone the viral. It has the 600,000 views as of the 10 PM. “Of course not, they are the Goldman Sachs. They make their money ripping off the American people”. LOL! UPDATE: 24 hours later, and close to a million page views.